Today we’re excited to announce that Yesware is among the first Google Apps Premier Technology Partners. Google’s technology partners provide complementary products which enhance or extend the value and functionality of Google Apps Core Services. In turn, the new technology track for the Google Apps Partner Program provides customers with access to cloud-based apps that help them run their businesses even better. As an early partner, Yesware has been recognized for its success in providing a differentiated user experience across Gmail, Google Calendar, and Google Drive, as well as for contributing to the success of customers that rely on our specialized sales solution. 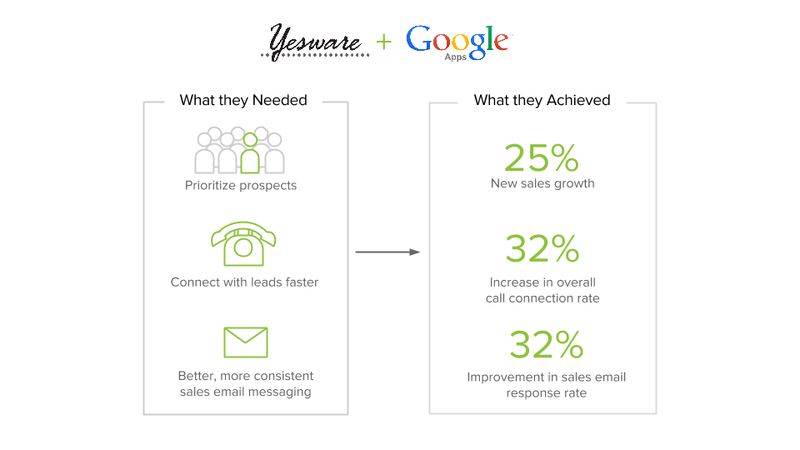 These are customers like Acquia, whose sales reps save over two hours each day by using Yesware’s Salesforce integration to manage their sales funnel, right from Gmail. Or Mimeo, where first year sales reps’ productivity increased by over 10 percent after leveraging Yesware’s Gmail tracking feature to gain insights on which emails pushed deals forward. To drive richer product integrations with Google Apps services so that we may continue to build on to our seamless Gmail, Google Calendar, and Google Drive integrations. To reach and serve more customers through the Google Apps Marketplace and other joint go-to-market efforts. For more information about the new technology track in the Google Apps Partners Program, you can check out Google’s announcement from earlier this year.